What has been the biggest challenge of building Cleo and what was the biggest reward? It has a 10’x10’ elevator, which is the largest elevator we have made in the Hubbard Stage. Mechanically, this is a huge challenge to make this work effectively. The reward for this will be getting it installed and running smoothly. 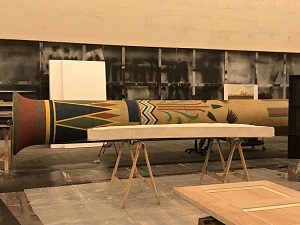 Every painted surface (except the backdrop and the columns) have to go through the ShopBot CNC router (computer controlled router) to do everything from carving hieroglyphics to laying all the patterns on the various surfaces to assist with the detailed paint treatment. This has been very rewarding because the CNC helped the painters save time with their layout, so we were able to paint the pieces very efficiently. How did Harvey affect the production of all these huge and intricate pieces? Harvey hit toward the beginning of the build for Cleo, so we started building it in the Production Center. Afterwards, however, we had to move and then build a majority of the set in the Gulf Warehouse (where we store stock scenery pieces). In this space, we encountered a few challenges: no air conditioning, limited space, and we could not do any steel work, so I had to re-engineer the scenic items so they could be built entirely out of wood, as well as fit in the back of a truck in smaller pieces. Once we got back into the Production Center, we were able to continue building the elevator (which is entirely made out of steel). Then, once the big freight elevator was fixed, we were able to bring all the scenic items we had built in the Gulf Warehouse to assemble everything. Also, we put the backdrop on the paint frame before Harvey and we finished it in February (our Scenic Artist completed it in between painting all the other scenic pieces for Cleo as well as the other productions we were doing). Another thing about the paint treatment: when we moved back into the Production Center, the Electric and Sound Departments were unable to get into their work spaces, so they were able to help us paint. 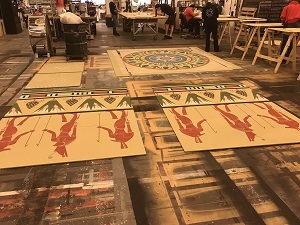 Since all the floor tiles had the patterns cut on them, the Electric and Sound Departments painted many of the tiles with us to help keep the production on schedule. This was just one example of the Alley Production Department coming together for each other. How has this project stood out from the other sets you’ve worked on at the Alley, and elsewhere? This will have been the longest we have worked on a show from start to opening. During the time we have worked on this show, we have completely built 3 other sets, loaded in a total of 6 shows, moved out of and then back into the Production Center/Theatre Building, as well as participation in a complete renovation/restoration on a theater space as well as ancillary facilities. It is the second tallest set we have built (As You Like It at UH was 1’-6” taller), but it is the tallest set we have built for the Hubbard Stage. In a perfect world, how would you like the artistry of the Cleo set to be interpreted from an audience perspective? What are you most excited for the audience to see? This production is about scale. 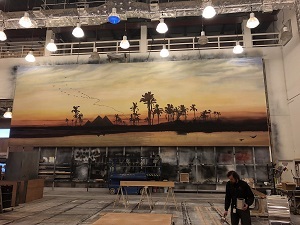 The set is actually taller than our Proscenium opening, this means that no matter where you are in the house (or even on the stage), the set is going to tower over everything. Also, this set shows that we can do that large scale scenery very well and the fact that every inch of the set has gone through our CNC router; was hand painted by our talented Scenic Artists; then applied to the huge structures by our Scenic Carpenters. I believe this set will showcase our level on talent in the shop. Personally, there is a piece over the doorway that we have called the Winged Snake Unit. The unit is made up of 93 individual pieces. Each of these pieces were drafted by me, cut on the CNC by a Carpenter, hand painted by our Scenic Artists, then laid out and assembled by a Carpenter. This unit is prominently featured over the two 15 foot tall doors that are covered in hieroglyphics and carved women. Was this the most involved set you’ve ever worked on? This set is definitely a very involved set; both the exterior conditions and the scale required us to approach it differently than how we typically build them. How has this set changed your perspective in pieces you’ll create going forward and your approach? This set has definitely challenged me to up my skills in adjusting plans/schedules to be flexible to overcome every obstacle that presented itself to us. I believe that we did it without having to compromise our artistic integrity. How do you think you will feel once Cleo starts and everything’s done? We have been dealing with this scenery for so long (by our standards), it will definitely feel good to get this show out of the shop and onstage. I am looking forward to seeing this show with an audience to see/hear it.